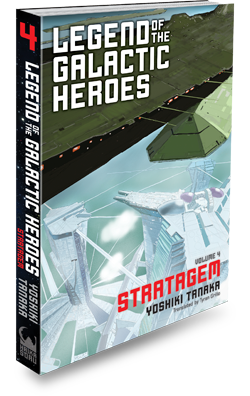 ﻿ Legend of the Galactic Heroes, Volume 4: Stratagem « Haikasoru: Space Opera. Dark Fantasy. Hard Science. Until nearly two years ago, Heidrich Lang had held an important bureaucratic position. As chief of the Bureau for the Maintenance of Public Order, his duties had involved rounding up political offenders and thought criminals, monitoring or suppressing free speech activities, and even dabbling in education and the arts. He was a fulcrum of authoritarianism within the imperial government, and as such exploited the full range of his power and influence. He stood to one day become secretary of the interior. Lang had not been put to death as a member of the old regime by von Lohengramm’s new order. There were two reasons for this: First, as chief of secret police he’d excelled at intelligence gathering and had amassed much in the way of valuable information on the nobles. Second, as a business specialist he possessed an awareness and loyalty all his own, and had expressed his intention to follow the new ruler after the former high nobles—whom Mittermeier maliciously dubbed the “shepherds”—fell. Lang saw no reason to despair over Reinhard’s abolishment of the bureau, and he believed in himself enough to wait patiently for the day when the sun would again dispel the darkness. His patience had paid off sooner than he’d expected. The military police, whose self-imposed disgruntlement was an apparent obligation of their work, were ordered by Senior Admiral von Oberstein’s office to release him from house arrest. Just looking at him, von Oberstein wanted to laugh—not that he would have said as much to his face. Lang’s outward appearance was incongruous with his talents and achievements. Although he wasn’t yet past forty, 80 percent of his brown hair had vanished. What little was left clung for dear life around his ears. His ashen eyes were big and restless. His lips were thick and red, although his mouth was small. His head was relatively big for someone of his short stature. His entire body was more than plump, and the skin covering it pink and glossy. In short, Heidrich Lang gave the visual impression of a healthy baby full of mother’s milk, and guessing his professional duties by his appearance alone wouldn’t have been easy for anyone with an active imagination. As chief of secret police, he stood out for not having a more coolheaded, grizzled exterior. But it was his voice that showed just how unique he was. The average person would have thought such a man to have the high-pitched voice of a child. What came out of Lang’s mouth was instead a solemn bass, like that of some ancient religious leader preaching the gospel to his believers. Those who stood ready to stifle their laughter were bowled over. Taking advantage of this contradiction caught his opponents off guard, and his bass had served him well as a weapon of interrogation. But the man before him now, whose artificial eyes stared at him inorganically by way of a light computer, would decide whether Lang deserved consideration and then report back to the imperial prime minister, Duke von Lohengramm. Lang spoke emphatically, and von Oberstein had already been evaluating Lang’s speech from word one. Lang’s voice was so much like that of a solitary man appealing to God that one almost expected a pipe organ to accompany him. Then again, holding full life-or-death authority as he did over Lang, von Oberstein was like God in that no matter how sincerely one spoke to him, it was never enough. Von Oberstein ignored the knee-jerk flattery. Like his master, Reinhard, he couldn’t help but notice that those who brownnosed him were always the ones who despised him. Ignoring that he was being ignored, Lang went on. It was a subtle turn of phrase, but von Oberstein again disregarded the man’s modest self-assertion. From beneath the clothes of this goodly intentioned advice, a holster of threat was beginning to peek out. If he was being accused not only for past misdeeds but also for his tenure at the bureau, then did he have something else in mind?